In Brooklyn, in the Age of Disco, Valentine Kessler -- a sweet Jewish girl who bears a remarkable resemblance to the Virgin Mary of Lourdes -- has an unerring gift for shattering the dreams and hopes of those who love her. Miriam, her long-suffering mother, betrayed and anguished by the husband she adores, seeks solace in daily games of mah-jongg with The Girls, a cross between a Greek Chorus and Brooklyn's rendition of the Three Wise Men, who dispense advice, predictions, and care in the form of poppy-seed cake and apple strudels. When her greatest fear for Valentine is realized, Miriam takes comfort in the thought that it couldn't get any worse. And then it does. Sagacious, sorrowful, and hilarious, An Almost Perfect Moment is a novel about mothers and daughters, star-crossed lovers, doctrines of the divine, and a colorful Jewish community that once defined Brooklyn. 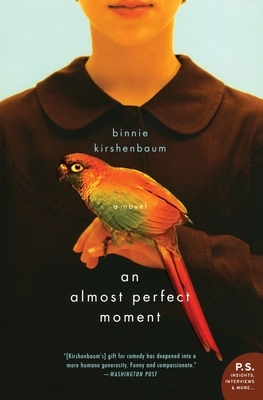 Binnie Kirshenbaum is the author of An Almost Perfect Moment, On Mermaid Avenue, A Disturbance in One Place, Pure Poetry, Hester Among the Ruins, and History on a Personal Note. She is a professor at Columbia University's School of the Arts, where she is chair of the Graduate Writing Program.